The 2017 Milwaukee Rally is Back! | Hupy and Abraham, S.C. 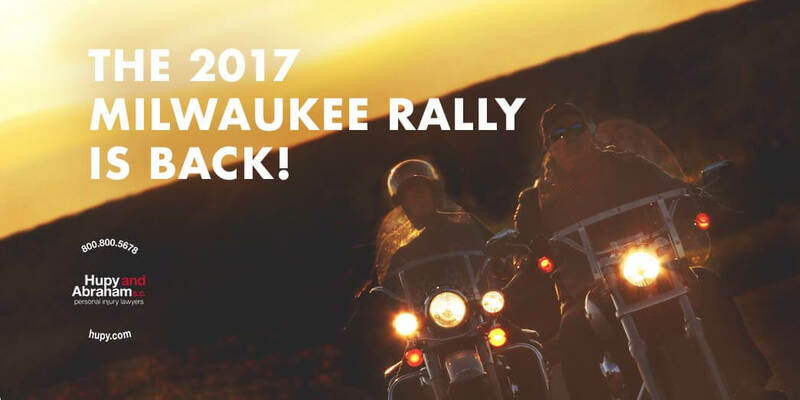 The 2017 Milwaukee Rally is Back! The 2017 Milwaukee Rally is back and we couldn’t be more excited! A whole week of all things motorcycle related is the highlight of our summer. All of metro Milwaukee comes to life with the sound of growling engines, music, and entertainment designed specifically with riders in mind. A long-time sponsor of the Milwaukee Rally, Hupy and Abraham is ready to celebrate and make sure that everyone knows to “Watch for Motorcycles!” Each year, thousands of riders descend upon Milwaukee for the festivities and we want to remind riders and motorists alike to be extra vigilant on the roads and to make safety a priority over the long Labor Day weekend. The largest free motorcycle rally in the Midwest! For 2017, we can expect tons of new and exciting events all weekend, from popular Milwaukee music acts to great food, great people and, of course, plenty of Harleys. Hupy and Abraham is also the sponsor of the Run for Cash again this year! Be sure to stop by our booths at EACH of the rally locations, including the Big Gig BBQ on September 6. We encourage you to stop at any of the Hupy and Abraham booths and get one of our “Watch for Motorcycles” stickers or T-shirts, and other rider-friendly safety and awareness materials. But, if you’re unable to attend any of the rally events, you can still get your free “Watch for Motorcycles” sticker here!